When I first saw the hackster.io Star Wars themed contest I knew I had to submit an entry. As a long time Star Wars fan and maker, it seemed like a great opportunity and a chance to get my hands on a Particle Photon. A few years back I had made a paper mache stormtrooper helmet, which is where the original idea came from. The concept was to upgrade the helmet and connect it to an AWS Alexa Skill/Echo to remotely issue commands. With this concept, I was lucky enough to receive a Photon! While considering how to actually implement the solution, I decided instead of a helmet, a blaster would be much more fun and provide for a few different interactions. The Particle application is pretty simple and I was surprised at how easy it is to setup the particle to receive command from the Alexa Lambda function. Basically an IoT device receiving values on different threads. For now on the blaster/particle side, the device accepts commands to play different audio clips via a serial connection to the MP3 trigger and via a command can change the clip that plays when you hit the trigger (stun or normal). 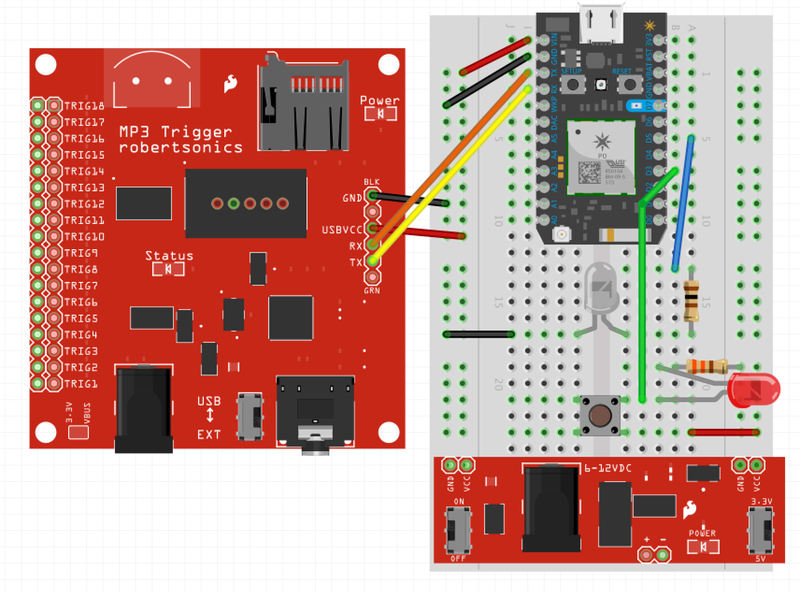 Note, I struggled for a long time on the serial connection between the Photon and the MP3 board, be sure to include: #include "application.h" in the .ino file and be sure to connect the GND between the two boards. 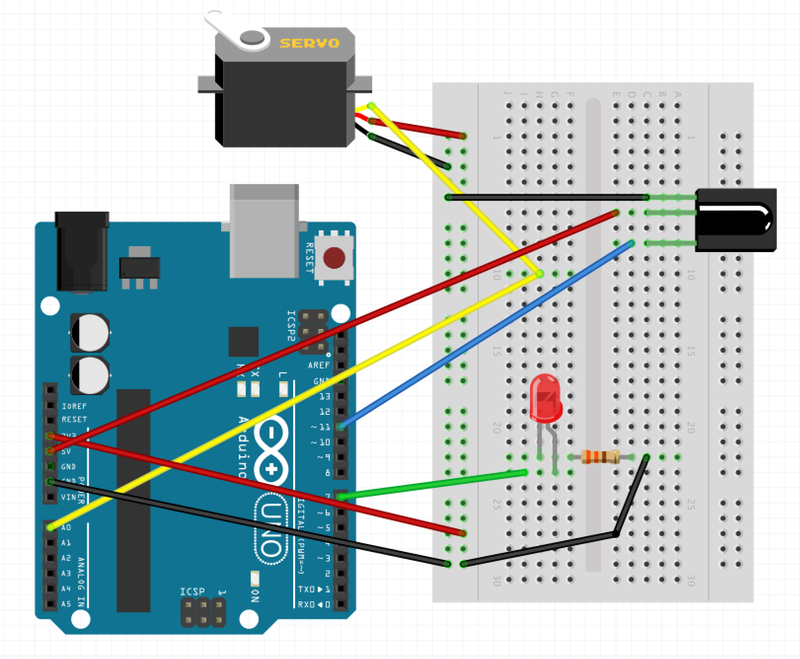 In the future, I'm planning on including a temperature probe that can be queried and keeping a counter of trigger pulls that will be updated on a web GUI. On the Amazon Echo side, I built an Alexa Skill to interact with the blaster. This again was surprisingly easy to setup, one note is you really only need to change a few things in the index.js file, otherwise don't touch the alexaskill.js file. Also, you'll need to zip the index, alexaskill, node_modules folder, and package.json files together and upload as a set to an AWS Lambda function. Its kind of a pain during troubleshooting, but works well again after you get the hang of it. Sample Utterance file that contains all the possible voice inputs and its corresponding intent. As you can see from the above, the application has two intents BlasterCommand and HelpIntent. BlasterCommand is invoked when you tell the Alexa (or Stromtrooper/blaster) to do any of the commands. HelpIntent is invoked when you ask for help. When the Alexa processes your voice input, it invokes AWS skill for all slot specified. The Node.js application is then uses a hosted AWS Lambda functions. You can see each of these files and the Node.js application in the GitHub Repository linked below. These installation steps are taken from one of the Alexa Skill Set sample. Name the Lambda Function "Stormtrooper_Blaster". Go to the the src directory, select all files and then create a zip file, make sure the zip file does not contain the src directory itself, otherwise the Lambda function will not work. Return to the main Lambda page, and click on "Actions" -> "Add Event Source"
Choose Alexa Skills Kit and click submit. Go to the Alexa Console (https://developer.amazon.com/edw/home.html) and click Add a New Skill. Set "Stormtrooper_Blaster" as the skill name and "storm trooper" as the invocation name, this is what is used to activate your skill. For example you would say: "Alexa, tell storm trooper to turn on stand guard"
You are now able to start testing your sample skill! You should be able to go to the Echo webpage (http://echo.amazon.com/#skills) and see your skill enabled.